The Long Earth will be released in hardcover and ebook in the US on June 19th, and it will be available in the UK on June 21st. I was all excited because I thought I found an excerpt, but it turned out to be a blank page that will most likely have an excerpt later. 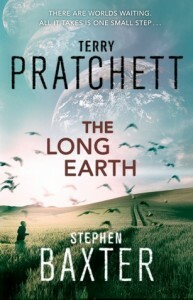 However, three characters from The Long Earth were recently described on Terry Pratchett’s Facebook page (along with the cover for Dodger, another book by Terry Pratchett that is coming out this fall).